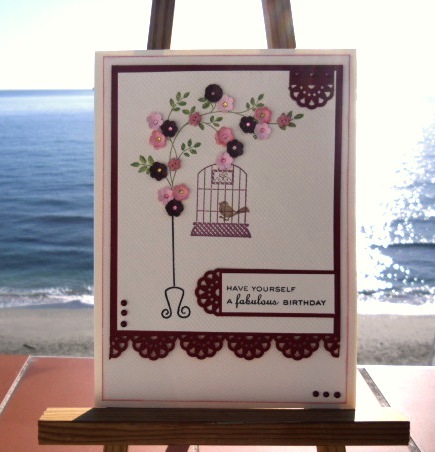 This card is so pretty and so clever, Sylvie! I love it! What a great card! Love those little flower buttons you used. Thanks for playing with the Paper Players. What a gorgeous card, Sylvie! I LOVE the border punch and the adorable little buttons! Thanks for playing with The Paper Players! Beautiful card. Love the birdcage and the clean and simple look. So sweet - just adorable! Love your card ! Love the tiny flowers with the tiny buttons, very pretty! Another beautiful card - I love your flowers. Pretty, pretty. Sometimes I just HAVE to make a second comment. Your design work is outstanding with this pretty creation!! This is super sweet---and I love the colors you've used! Thanks for playing with us this week at the Paper Players and using your buttons! Lovely super cute little buttons!! They look beautiful alongside that gorgeous birdcage. I have two button tins. Some of the buttons are brand new and sparkly, some have been taken off clothes that aren't suitable for the charity bags and others that belonged to my late MIL. I do love my buttons. Okay, this is an absolutely BRILLIANT use of your stamps!!! May I CASE you? This is amazing!!! What a cute image! That stand and bird cage all decorated up by you is lovely! WOW!!! Sylvie, this is stunning!